In Tuesday’s Times, I write about Senator Dianne Feinstein’s bill to create two Mojave Desert monuments in California that would ban renewable energy projects on lands that are both coveted for solar farms and valued for their sweeping vistas and populations of rare wildlife. The mere prospect of the legislation has derailed several massive solar power plants planned by Goldman Sachs and other developers. But Mrs. Feinstein, a California Democrat, has included provisions in the bill that could, if enacted, accelerate renewable energy development and ease tensions over endangered species that are slowing other solar projects outside the monument area. The legislation also features a pilot program to assemble huge tracts of land -– at least 200,000 acres — to be used as endangered species habitat to make up for areas lost to renewable energy production. AMBOY, Calif. — Senator Dianne Feinstein introduced legislation in Congress on Monday to protect a million acres of the Mojave Desert in California by scuttling some 13 big solar plants and wind farms planned for the region. But before the bill to create two new Mojave national monuments has even had its first hearing, the California Democrat has largely achieved her aim. Regardless of the legislation’s fate, her opposition means that few if any power plants are likely to be built in the monument area, a complication in California’s effort to achieve its aggressive goals for renewable energy. Developers of the projects have already postponed several proposals or abandoned them entirely. The California agency charged with planning a renewable energy transmission grid has rerouted proposed power lines to avoid the monument. “The very existence of the monument proposal has certainly chilled development within its boundaries,” said Karen Douglas, chairwoman of the California Energy Commission. For Mrs. Feinstein, creation of the Mojave national monuments would make good on a promise by the government a decade ago to protect desert land donated by an environmental group that had acquired the property from the Catellus Development Corporation. “The Catellus lands were purchased with nearly $45 million in private funds and $18 million in federal funds and donated to the federal government for the purpose of conservation, and that commitment must be upheld. Period,” Mrs. Feinstein said in a statement. The federal government made a competing commitment in 2005, though, when President George W. Bush ordered that renewable energy production be accelerated on public lands, including the Catellus holdings. The Obama administration is trying to balance conservation demands with its goal of radically increasing solar and wind generation by identifying areas suitable for large-scale projects across the West. Mrs. Feinstein heads the Senate subcommittee that oversees the budget of the Interior Department, giving her substantial clout over that agency, which manages the government’s landholdings. Her intervention in the Mojave means it will be more difficult for California utilities to achieve a goal, set by the state, of obtaining a third of their electricity from renewable sources by 2020; projects in the monument area could have supplied a substantial portion of that power. “This is arguably the best solar land in the world, and Senator Feinstein shouldn’t be allowed to take this land off the table without a proper and scientific environmental review,” said Robert F. Kennedy Jr., the environmentalist and a partner with a venture capital firm that invested in a solar developer called BrightSource Energy. In September, BrightSource canceled a large project in the monument area. California Senator Dianne Feinstein’s move to put a large swath of the Mojave Desert off-limits to renewable energy development is splitting the environmental movement and could derail some two dozen solar and wind power projects the state needs to comply with its ambitious climate change laws. The companies are among scores that have filed lease claims on a million acres of acres of desert dirt controlled by the U.S. Bureau of Land Management. California utilities PG&E (PCG) and Southern California Edison (EIX) have signed long-term power purchase agreements for some of the projects now in jeopardy and are counting on the electricity they would produce to meet state-mandated renewable energy targets. PG&E itself has filed a solar power plant land claim in the proposed national monument. The area of the desert in dispute is some 600,000 acres formerly owned by Catellus, the real estate arm of the Union Pacific Railroad, and donated to the federal government a decade ago by the Wildlands Conservancy, a Southern California environmental group. About 210,000 of those acres are managed by the U.S. Bureau of Land Management, which opened part of the land to renewable energy projects. The Catellus land controlled by the BLM forms something of a golden triangle between the Joshua Tree National Park and the Mojave National Preserve in Southern California and are particularly coveted for renewable energy development because of its proximity to transmission lines. Alan Stein, a deputy district manager for the BLM in California, told Green Wombat that the solar and wind lease claims are in areas that are not designated as wilderness or critical habitat for protected species like the desert tortoise. “This is public domain land, ” he says. 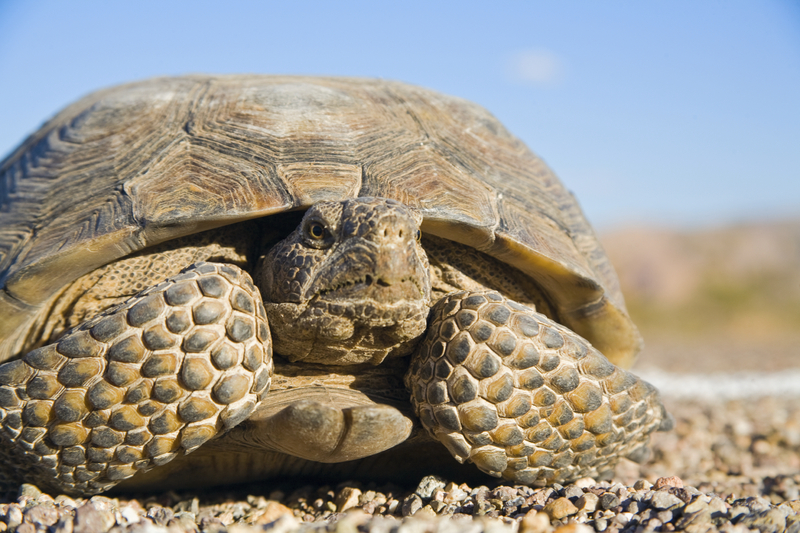 Tortoises, however, are found across the Mojave, and battles over Big Solar’s impact on endangered wildlife are quietly brewing in several solar power plant licensing cases now being reviewed by the California Energy Commission. Environmentalists find themselves walking a thin green line, trying to balance their interest in promoting carbon-free energy with protecting fragile desert landscapes and a host of threatened animals and plants. Take BrightSource Energy’s Ivanpah 400-megawatt solar power plant complex on the California-Nevada border. The three solar power plants to be built by the Oakland-based company will supply electricity to PG&E and Southern California Edison. But the project will also destroy some 4,000 acres of desert tortoise habitat and at least 25 tortoises will have to be relocated – a somewhat risky proposition as previous efforts in other cases have resulted in the deaths of the animals. The big national enviro groups are working with the government and power plant developers to create zones in the Mojave where renewable energy projects would be permitted while setting aside other areas that are prime habitat and wildlife corridors. A similar effort is underway on the federal level to analyze the desert-wide impact of renewable energy development. Local environmental organizations, however, have split with the Big Green groups over developing the desert and other rural areas. In San Luis Obispo County, Ausra, SunPower (SPWRA) and First Solar’s (FSLR) plans to build three huge solar farms within miles of each other has prompted some local residents worried about the impact on wildlife to organize in opposition to the projects. It would be unwise to underestimate Klasky. In the 1990s, he helped lead a long-running and successful campaign to scuttle the construction of a low-level radioactive waste dump in tortoise territory in the Mojave’s Ward Valley – now a prime solar spot. Still, while California’s senior senator’s move in the Mojave may exacerbate rifts in the environmental movement over renewable energy, it also could galvanize efforts to resolve critter conflicts in a comprehensive way. Otherwise, environmentalists of varying hues may find themselves fighting each other rather than global warming. Update: I just had a conversation with BrightSource spokesman Keely Wachs, who takes issue with my characterization that the Ivanpah project will “destroy” desert tortoise habitat. He points out that the company is taking care to minimize the impact of the power plant on the surrounding desert and that wildlife may still occupy the site. It would be more accurate to say that the project will remove desert tortoise habitat from active use during Ivanpah’s construction and operation. The land rush to stake prime sites in the Mojave Desert for solar power plants has moved east from California to a state that knows a thing or two about desert dreaming and scheming — Nevada. When Green Wombat’s story on the solar land rush was published in the July 21 issue of Fortune (see “The Southwest desert’s real estate boom”), solar energy developers, financiers and speculators had filed lease claims on 226,000 acres of federal land in Nevada. Today, 702,000 acres are in play, largely thanks to Goldman Sachs’ aggressive moves to lock up land. The New York investment giant has put claims on about 300,000 acres of Bureau of Land Management dirt in the Silver State — in one week alone, it filed claims on some 187,000 acres. Given its financial firepower, Goldman’s designs on the desert have been a matter of intense interest. (The firm also has filed claims on 125,000 acres in California.) Goldman (GS) declined to discuss its solar strategy, but a review of BLM documents and interviews with green energy executives sheds some light on its power plans as the financial crisis triggers a shakeout in the solar land rush. Over the past two years, scores of companies — from Silicon Valley startups to Chevron (CVX) to utility FPL (FPL) — have scrambled to put lease claims on the nation’s best solar real estate to build massive megawatt solar power plants. In California, where utilities face a state mandate to obtain 20% of their electricity from renewable sources by 2010 with a 33% target by 2020, claims have been filed on nearly 1 million acres. If all those solar stations were built, they would generate a staggering 60,000 megawatts of electricity, or nearly twice the power that California currently consumes. With most of the prime solar hot spots taken in California, the action is moving to sun-drenched states like Nevada where there’s plenty of wide-open desert land. The BLM has yet to issue any leases and is currently evaluating the applications on a first come, served basis. A key consideration: whether the applicant can deploy a viable solar technology. But with the credit crunch threatening to derail many of those projects, companies are jockeying to score the best sites – those near transmission lines and water – when the weak are weeded out by a failure to obtain financing or a proven solar technology. Some sites have two or three companies queued up in case the first company in line falters. For its part, Goldman Sachs has brought in its Cogentrix Energy subsidiary to develop its solar projects, according to BLM records. Cogentrix is a Charlotte, N.C.-based owner and operator of coal and natural gas-fired power plants that Goldman acquired for $2.4 billion in 2003. “Cogentrix doesn’t have a solar technology,” says Rob Morgan, executive vice president and chief development officer for Silicon Valley solar startup Ausra. He says Ausra, which is building a solar power plant for utility PG&E and itself has staked claims in Arizona and Nevada, has held discussions with Goldman about its solar technology. European renewable energy companies are also taking advantage of the market turmoil. State and federal records show that Iberdrola Renewables, a spinoff of Spanish energy giant Iberdrola, has quietly acquired a year-old Henderson, Nev., startup called Pacific Solar Investments — and its claims on about 180,000 acres of desert land in Arizona, California and Nevada. Iberdrola Renewables is the world’s largest wind developer. The saga of Pacific Solar shows how cutthroat the competition for solar real estate has become. Just ask Avi Brenmiller, CEO of Israeli solar power plant company Solel, which last year inked a 553-megawatt deal with PG&E (PCG). Brenmiller now finds himself up against his former COO, David Saul, who set up Pacific Solar and began filing land claims while still working for Solel, according to BLM records and Brenmiller. During this time, Saul also was making land claims on behalf of a second solar company, IDIT, where he serves as CEO, according to filings with the Arizona Secretary of State’s office. Five days after leaving Solel in August 2007, Saul filed a claim on a California site, getting second in line behind Goldman but beating his former employer to the punch by a week. Solel is now behind Pacific Solar and IDIT on two other sites. “So he’s now a competitor in the land rush, which is one of the problems we face,” Brenmiller told me ruefully when we met in San Francisco earlier this year. Saul did not respond to requests for comment. Iberdrola Renewables also did not return requests for comment. French energy company EDF’s U.S. subsidiary, enXco, meanwhile has been joined in the land rush by Portuguese utility company EDP and Germany’s Solar Millennium. Spanish renewable energy heavyweight Acciona’s name doesn’t appear on any land claims. But the CEO of Acciona’s U.S. solar operations, Dan Kabel, started a company called Bull Frog Green Energy that has filed claims on 56,000 acres in California and Nevada. Kabel did not respond to a request for comment. Other new players in the desert solar game include U.S. energy giant Sempra (SRE), which wants to lease 11,000 acres in California’s Imperial County for a 500-megawatt photovoltaic power plant. That could be good news for solar cell maker First Solar (FSLR), which is currently building a smaller solar power plant for Sempra in Nevada. Johnson Controls (JCI), the Fortune 100 automotive and power systems conglomerate, has put in a solar land claim in Nevada. Even former hotel magnate Barry Sternlicht, founder of Starwood Hotels & Resorts, wants a piece of the action through his Starwood Energy Group, which has filed claims in Arizona and Nevada to build solar power plants. SolarReserve, a Santa Monica, Calif-based solar startup backed by Citigroup and Credit Suisse, has BLM land claims in California and Nevada and is also negotiating with smaller companies that staked claims on prime solar power plants with access to the transmission grid. Industry insiders say a shakeout in the land rush is inevitable, given the credit crunch and too many companies in the chase for the best solar power plant sites. That’s Ausra’s thinking. With the financial crisis putting the billions of dollars needed to build big solar projects out of reach, the company is repositioning itself as a supplier of solar technology as well as a builder of solar power plants. For those readers who missed Green Wombat’s feature story on the solar land rush in the July 21 issue of Fortune – available here at Fortune.com – I reprint below. From California to Arizona, demand for sites for solar power projects has ignited a land grab. (Fortune Magazine) — Doug Buchanan grins with relief when he sees the carcasses. He has just driven up a steep dirt road onto a vast, sunbaked mesa overlooking the Mojave Desert in western Nevada. There, a few feet from the trail, lie the corpses of two steers. A raven perches on one, the only object more than three feet above the ground on this pancake-flat plateau. Cattle, dead or alive, qualify as good news in Buchanan’s line of work. If cattle are present, that means grazing is permitted, and that in turn means that this land is most likely not protected habitat for the desert tortoise. Buchanan, 53, is scouting sites for a solar power company called BrightSource Energy, an Oakland-based startup backed by Google and Morgan Stanley. The blunt, fifth-generation Californian, who used to survey the same area for natural-gas power sites, knows that the presence of an endangered species such as the tortoise could derail BrightSource’s plans to build a multibillion-dollar solar energy plant on the mesa. That’s putting it mildly. A solar land rush is rolling across the desert Southwest. Goldman Sachs, utilities PG&E and FPL, Silicon Valley startups, Israeli and German solar firms, Chevron, speculators – all are scrambling to lock up hundreds of thousands of acres of long-worthless land now coveted as sites for solar power plants. It’s not just a federal-land grab either. Buyers are also vying for private property. Some are paying upwards of $10,000 an acre for desert dirt that a few years ago would have sold for $500. No doubt the prospect of potential riches is overheating expectations. But California and surrounding states have mandated massive increases in renewable energy in the next few years. That has led some experts at Emerging Energy Research of Cambridge, Mass., to predict that Big Solar could be a $45 billion market by 2020. Meanwhile, the land rush is setting the stage for a showdown between solar investors and those who want to protect a fragile environment that is home to the desert tortoise and other rare critters. The Southwest is on the cusp of what could be a green revolution. And the biggest obstacle of all may be … environmentalists. Over the past year a parade of executives bearing land claims have made the trek to a stucco BLM office just off the interstate in the dusty city of Needles, Calif., a 110-mile drive south from Las Vegas. (It’s the town where the late “Peanuts” cartoonist, Charles M. Schulz, briefly lived as a boy; in the comic strip, Snoopy’s brother Spike is a resident.) The Bush administration has instructed the BLM to facilitate renewable-energy projects (along with nonrenewable ones). But Sterling White, the BLM’s earnest Needles field manager, is also concerned about what could happen if they transform the Mojave into a collection of giant power stations. “One of our biggest challenges is the cumulative impact of these projects,” he says. Nearly 80% of the land that White’s office oversees is federally protected wilderness or endangered-species habitat. That leaves about 700,000 acres for solar power plants, only some of which are near transmission lines. Land leases are handed out on a first-come, first-served basis, but White is also supposed to weed out speculators from genuine solar developers based on loose criteria such as who is negotiating with utilities and who is applying for state power licenses. White has yet to approve a single lease, but he has summarily rejected four because they lie in protected-species habitat. Solar prospectors tend to be as secretive about their land as forty-niners were about the veins of gold they discovered. Most bids are placed by limited-liability corporations with opaque names that conceal their ownership. And no one has been as quick to move into the Mojave – or as tightlipped about it – as Solar Investments. Nobody expects Goldman to begin operating solar plants. It will probably either partner with another developer or sell its limited-liability company (and its leases) outright. The firm has been making the rounds of solar developers. “The conversation’s been pretty wide-ranging, primarily as an investor interested in financing deals,” says one solar energy executive approached by Goldman. “But there’s clearly an element of interest in our technology.” Goldman has requested permission to install meteorological equipment on its sites and is evaluating “competing technologies, including solar dish systems, power towers, and large-scale photovoltaic arrays,” according to a letter Goldman sent to the BLM in August 2007. Competitors are lining up behind Goldman, staking claims on some of the same sites in hopes the bank will abandon them. PG&E and FPL, for instance, are in the queue after Goldman on one site. Solel, an Israeli solar company that last year scored a contract to deliver 553 megawatts to PG&E, is third in line behind Goldman on another. “I view Goldman as a very interesting indicator of things to come,” says Brian McDonald, PG&E’s director of renewable-resource development. “They’re usually ahead of the curve – you can extract a huge amount of value if you get in early.” There’s other smart money here too. A Palo Alto startup called Ausra received $40 million from the elite green venture capitalists Vinod Khosla and Kleiner Perkins Caufield & Byers. Ausra has signed a deal with PG&E and announced its intention to construct a gigawatt’s worth of projects a year. With the prime BLM sites quickly being snapped up – recently the agency temporarily stopped accepting new land claims while it develops a desertwide solar policy – competition is growing for private land. Here, too, the emphasis on secrecy borders on the obsessive. A request to view a piece of desert that is up for sale is treated as if I had asked to visit Area 51. Waiting outside a roadside diner in southwestern Arizona – I’ve promised not to say where – with BrightSource senior vice president Tom Doyle, I expect to see a weather-beaten farmer come chugging up in a battered pickup. Instead, a pale-green Volvo SUV driven by a physician glides into the parking lot. The doctor, who wishes to remain anonymous, acquired the land two years ago as the renewable-energy boom got underway. “We thought we’d put solar on it – that’s the reason we bought it,” the doctor says as we pile into the Volvo and head into the desert to visit the site. After about five miles we turn off the road and come to a stop in a rocky patch of desert framed by low-slung mountains and buttes. Doyle quizzes the physician about water rights, endangered species, and access to transmission lines before moving out of earshot to talk dollars. The whole process takes only about 20 minutes – the two sides ultimately decide not to do a deal – and then Doyle is on to visit the next potential property. Such is the land frenzy that farmers in Arizona were paid $45 million for 1,920 acres by Spanish solar company Abengoa so that it could build a 280-megawatt power plant; the land had an assessed value of a few hundred thousand dollars. The company also plunked down $30 million for 3,000 acres in the California Mojave that had traded hands for $1.25 million nine years earlier. That prompted developer Scott Martin to put his adjacent 300-acre parcel – land he had bought only a few months earlier for $457,500 – on the market for $3 million. Also for sale: a $15 million, 3,000-acre tract near Palm Springs, which Martin began shopping around to solar executives like Ausra’s Perry Fontana. When I join Fontana to check out the site, a onetime World War II air base outside the Mojave ghost town of Rice, he says, “I probably get three calls a day from brokers or landowners.” As if on cue, his Bluetooth earpiece lights up with a cold call from a broker peddling some land near Needles. California wildlife regulators, for instance, have peppered Ausra with requests for more biological surveys on the site of a 177-megawatt solar power plant to be built in San Luis Obispo County. The feds could also require Ausra to prepare a plan to protect the San Joaquin kit fox, a process that could take years and shred the project’s economic viability. Worse for developers, state and federal law require wildlife officials to consider the total impact of multiple projects when weighing whether to approve any individual facility. Next door to Ausra’s solar farm, for example, is OptiSolar’s planned 550-megawatt power plant, which would cover 9 1/2 square miles of potential endangered-species habitat with solar panels. Will the regulators approve one? Both? Nobody knows.